← Is journalism going through its own Reformation? Early on Tuesday morning, I walked up Massachusetts Avenue to attend the FTC workshop on the future of journalism. Ten hours later, I emerged overstimulated by the volume of ideas presented, saddened again by the tens of thousands of journalists who have lost employment and energized by the quality of the conversations I’d had. If you look at Danny Sullivan’s impressive liveblog of the FTC workshop on the future of journalism, you’ll see why. The event began with a video about the changing media world from Minnesota Public Media, embedded below. More about the “Future of News Summit, where it premiered, can be found at thefutureofnews.ning.com. 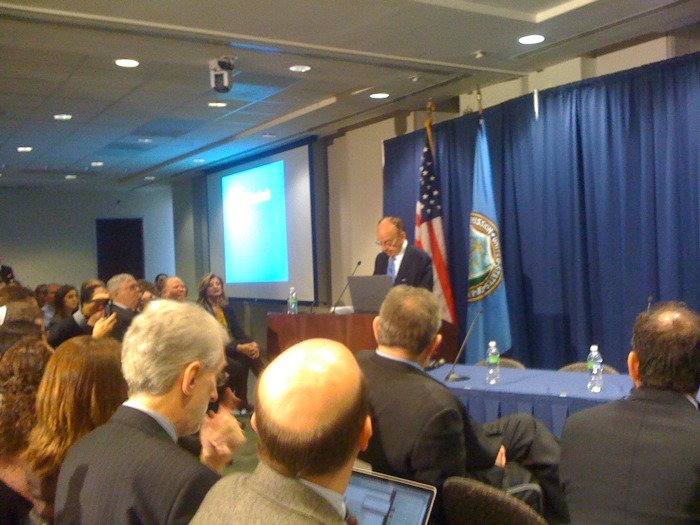 The FTC established a Twitter account for the conference, @FTCnews. You can see all of the participants’ tweets aggregated at #ftcnews. ..the ongoing revolution in the markets for news, then, warrants serious study for at least two reasons. First, markets for public goods such as news may work imperfectly. Competition policy is well-suited to evaluate these market imperfections. Consumer protection policy is well-suited to help us understand the privacy and data security implications of the behavioral marketing used by media companies to increase ad revenues online. Second, and far more important, this is not just any market. The changes we are seeing in journalism will affect how we govern ourselves, not just the profits and losses of various news organizations. Leibowitz was followed by Paul Steiger of Propublica, an “independent, non-profit newsroom that produces investigative journalism in the public interest. “The answer is not to save newspapers,” said Steiger. “The goal should be to assure the continuation of journalism.” He called Amanda R. Michel an “Internet genius” for her coverage of the 2008 campaign at the Huffington Post. Steiger also cited Propublica’s investigative journalism on “hydraulic fracturing” in gas drilling as an example of the work the organization is doing. Rick Edmonds of the Poynter Institute, author of the BizBlog there, presented results of 2009 State of the media study he co-authored. One of his final assessments was sobering: “Most surviving newspapers will be smaller, more expensive & targeted to older consumers.” As I replied to Andy Carvin , who wondered about the statement, given the debt loads that Edmonds cited, waiting for hyperwired Echo Boom to “age into” newspapers might be a tough strategy. It’s a fair bet that the packed room in the morning was there in anticipation of remarks from Rupert Murdoch, founder, chairman and managing director of News Corporation, especially given that many of the media in attendance left to file stories once he was through. Further, even as he argued that the feds should keep the U.S. press the most free in the world, the government should also “use its power to make sure the most innovative companies can reach customers,” a view that sounded to this writer’s ears rather like net neutrality. He was also crystal clear in a conviction: “online ads can’t sustain good journalism.” Murdoch intends to extend the pay model of the WSJ and @BarronsOnline to the Times UK, perhaps as early as next January. Murdoch also suggested that the FCC‘s cross-ownership rule that prevents single ownership of both TV and newspaper in local markets was “out-dated” in the Internet age, effectively suggesting that regulators both stay out of the news business and change the market conditions. He also observed that “for newspapers, spectrum could well prove an economic vehicle,” pointing to online convergence and the move to a readership increasingly consuming news through mobile computing devices. What is the state of journalism? Following Murdoch’s remarks, a state of journalism panel began with a focus on the financial health and accomplishments of newspapers and magazines. Martin Kaiser, senior vice president of the Milwaukee Journal Sentinel, spoke to journalism’s essential role: enforcing goverment accountability. This panel also raised the first – and as it turned out, only – question to the audience, in the form of a poll: How many of you know someone under 30 who reads a newspaper in print? To my eye, about 40% of those present raised their hands. It’s perhaps worth observing that very few people present were in that demographic. One hopeful model for reporting by assignment that was cited by David Westphal, Executive in Residence, Annenberg School for Communication & Journalism, University of Southern California, hailed from my former neck of the woods at the New England Center for Investigative Reporting. Mark Contreras, chairman of the Executive Committee of the Newspaper Association of America & senior VP, newspapers at the E.W. Scripps Co., ended the panel with an analogy to the music industry, suggesting that there are “poignant similarities” to news business. He favors ASCAP/BMI models for content protection and a B2B model for revenue generation. Given the music industry’s struggle to adapt to the Internet, that approach might merit more consideration. After the representatives of legacy media shared their perspectives, Arianna Huffington came to the defense of aggregators and new media, like her own enterprise, the Huffington Post. As she dryly observed, citing a post by Mike Masnick at TechDirt, there’s some news aggregation by News Corp/IGN out there. All Things Digital, for instance, links and aggregates content, as does Rotten Tomatoes. It’s time for traditional media companies to stop whining and face the fact that far too many of them, lulled by a lack of competition and years of pretax profits of 20 percent or more, put cash flow above journalism and badly misread the web when it arrived on the scene. The focus was on consolidation, cost-cutting, and pleasing Wall Street — not modernization and pleasing their readers. They were asleep at the wheel, missed the writing on the wall, let the train leave the station, let the ship sail — pick your metaphor — and quickly found themselves on the wrong side of the disruptive innovation the Internet and new media represent. And now they want to call timeout, ask for a do-over, start changing the rules, lobby the government to bail them out, and attack the new media for being… well, new. And different. And transformational. Suddenly it’s all about thievery and parasites and intestines. Where are the readers? Whither remedies? A Yahoo! News consortium? And how does Google News work? After lunch, media analyst Ken Doctor shared his thoughts about “where the readers are.” You can read more from him at Contentbridges.com. Lem Lloyd, vice president of channel sales at Yahoo!, shared details of the media company’s growing newspaper consortium. Lloyd said they’ve have sold 18,000 campaigns on Yahoo!, amounting to more than six billion impressions. Behavioral targeting sales represent some ninety percent of that total. And Josh Cohen explaining how GoogleNews works with publishers. Cohen wrote about the FTC and the future of news at Google’s Public Policy blog. A extensive interview of Cohen on paywalls, publishers and partnerships by Danny Sullivan is also available at Search Engine Land. The most dynamic panel of the day featured technologists, entrepreneurs and an bonafide bloggers like Josh Micah Marsall of Talkingpointsmemo.com and Danny Sullivan, who took a break from liveblogging to participate. Sullivan, at that point, was frustrated with offline metaphors applied online. And Jeff Jarvis, media pundit and CUNY professor, asked the FTC to “stay off the lawn,” suggesting that premise of the event was about the survival of legacy players, not journalism itself. Chris Ahern, of Reuters, and Danny Sullivan replied to Thomson that it’s not “an either/or proposition.” Hybrid models for news are worth trying. And in a memorable exchange, Marshall observed that “there is more of an ethic online of linking to the story that got the reporter on the track and then adding commentary” than is practiced by traditional media, alluding to stories that the AP and others have run with without linking. 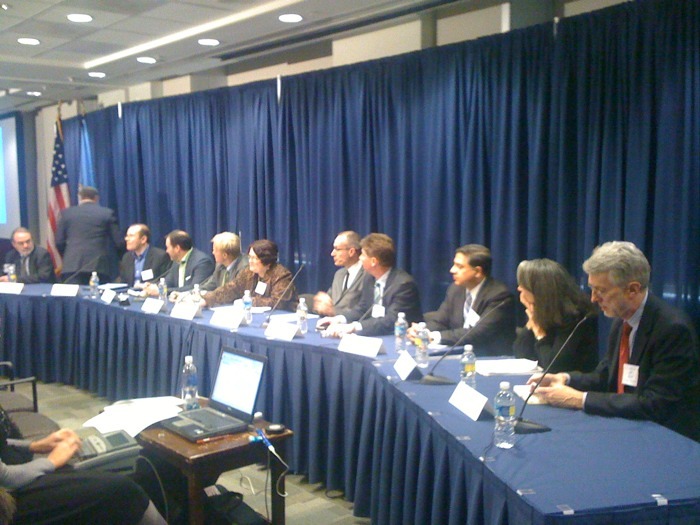 For more on the final panel and preceding presentations, consult Danny Sullivan’s liveblog of the FTC workshop on the future of journalism. Ball State professor Mike Bloxham presented on media consumption based upon data that can be found at ResearchExcellence.com. He described a need for publisher to look cross-platform for media consumption in order to meaninfully gauge a “news footprint” that included print, TV, online and radio. Susan Athey, a professor of economics at Harvard, presented on the economics of news, particular the trend toward “multi-homing” in consumption and the growth of online advertising. 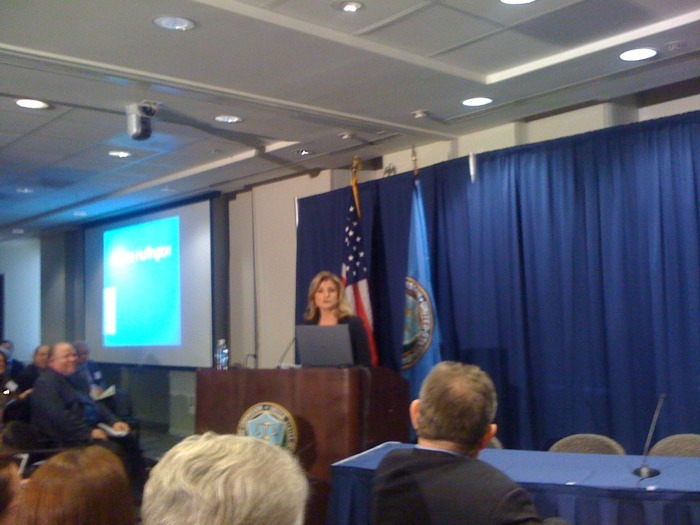 Her presentation addressed the salience of potential FTC regulation more directly than any other, aside from the chairman himself, predicting competition in online ad networks and between aggregators that would require oversight. Law professor David Evans, following Athey, said that “the one thing I do worry about is mixing up market failure with nostalgia.” His paper on economics of the online advertising industry is available online. As I look back over the day, it’s not clear to me yet what the FTC intends to do, other than listen. I look forward to returning to the FTC tomorrow to learn more. Thanks for cataloging all this. I really wanted to get over there, but finals + conflicting appointments prevented it. But after reading this, I almost feel as if I did attend. Looking forward to hearing more tomorrow (later today? ).